Sweet peas (Lathyrus odoratus) are probably the most popular annual flower, being especially prized for their colour and scent. Smaller cultivars are available for hanging baskets and containers. Sweet peas growing informally up canes. Credit: RHS Herbarium. Sweet peas are easy to grow from seed, although you can buy plants in garden centres in spring. But there is a far wider range of colour and scent if you grow from seed. Indoor sowing: Sow indoors from October to November, overwintering young plants in a cold frame or unheated greenhouse. You may get earlier blooms this way. Otherwise, sow from January to April. Outdoor sowing: Sow directly into the ground in March or April, although the results are generally less satisfactory than indoor sowing. Sweet peas often have a hard seed coat making them more difficult to germinate. To soften the seed coat, place seeds on a layer of moist vermiculite or kitchen tissue in an airtight container in a warm room, and sow as soon as they swell or begin to sprout. Don't soak the seeds. For stubborn seeds that haven't swollen, chip the hard seed coat opposite the 'eye' (small, round scar) using a sharp penknife to help moisture entry and germination. Opinions vary, but when growing for the garden it is generally considered beneficial to pinch out tips when plants reach about 10cm (4in). This encourages strong side-branching. Grow sweet peas in fertile, well-drained, humus-rich soil, in full sun or very light dappled shade. 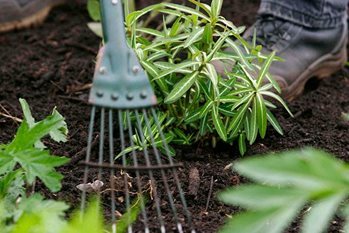 For best results, incorporate organic matter such as garden compost or well-rotted manure at least four weeks before planting, and apply a general fertiliser, such as Vitax Q4 or Growmore, at the manufacturers' recommended dose. After planting, water the plants well during dry spells. On poorer soils, a bi-weekly, high potassium liquid fertiliser such as tomato feed may be beneficial. Supports: Sweet peas are usually allowed to scramble up pea sticks, canes wigwams or trellis. Alternatively, use post and netting supports. Use dwarf bush-type sweet peas for pots, hanging baskets or as ground cover. For a long and regular supply of blooms: cut flowers frequently, before they produce seed pods. This method is used by professional growers to produce top quality blooms. Cordons are trained as single-stemmed plants to individual canes, with sideshoots and tendrils removed so that all the plant's energies are diverted into flower production. See the National Sweet Pea Society website for more information on this method. For more choices, check for RHS AGM Plants or use the RHS Find a Plant for over 50 cultivars with images and details.